Opening day of this year's Galway Senior Football Championship produced two lopsided affairs that lacked any real cutting and never set the supporters' pulses racing at any stage. Fifteen minutes into both games, and it would not have taken an oracle to predict the victors at that early stage. In the first game, last year's beaten county finalists Salthill/Knocknacarra raced into a huge lead that had Milltown rocked on their heels by the time they had found their bearings. The Salthill management team of Val Daly, Tom Kelly and Seán O' Dowd had their team flying from the off, and with county minor Evan Murphy, Seán Armstrong, county U-21 Robert Finnerty, Brian Conlon, and the impressive Andrew Butler all linking well up front, the Milltown defence creaked and swayed like an old beaten-up tree in gale force winds. When the Seasiders raced into an 11-point lead mid-way through the first half it looked like a total rout was on the cards. But, to their credit, the "Scans" rallied and a goal by Diarmuid Blake gave them something to fight for in the second half. New manager Dessie Dolan (senior ) laid it on the line for them at half-time and they came out for the second period well up for the fray. However, the damage had been done at that stage, and it never really looked like they would have the pace or stamina to catch the city lads. When Milltown tired in the final quarter, Salthill grabbed for a few late goals and won pulling up, 5-12 to 1-12. Salthill went to sleep in the third quarter - something that would burn them against the other top teams later in the championship. However, they must be considered possible contenders for the title. With a large panel and four or five scoring forwards, they also have a few powerful men at the back, such as Gavin Duffy, Ruaidhrí McTieran, John Maher, Conor Halloran and Conor Healy. They will not let anyone waltz down the middle of their defence. Younger defenders such as William Finnerty and Evan Wynne and forward Eamon Conroy, all of them former Coláiste Iognáid students, are talented players and add to the squad. When you see Salthill introducing five or six new players onto their championship panel, it highlights the colossal problems rural clubs such as Milltown face. Milltown have been utterly over dependent on the Blakes, Darren Mullaghy, and to a lesser extent James Kavanagh, over the past few seasons and those players have a lot of miles on the clock. Their team urgently needs an injection of youth. And the young players required are not there. Nor will they be coming along any time soon. Every business needs new products and new deals in the pipeline, and likewise GAA clubs need talent coming online regularly from U14, U16.minor and U21 to augment senior level. The likes of Milltown, Killererin, who were hammered out the gate by 20 points by Annaghdown, and Caltr who were beaten by 14 points by St James, do not have the population to find sufficient talented underage players to fill the gaps at senior level. A parent whose son goes to the main national school in Milltown told me there were 11 girls and three boys in her son's class. Those kind of figures are not unusual so from where are the lads for the club's future underage teams going to come? Killererin, a club that won four senior county titles between 1999 and 2010, look to be in the same boat, only the water is rising a lot faster based on their 3-14 to 0-3 hammering at the hands of Annaghdown. Killererin only scored one point from play, and only one player, Shane Hughes, managed to score at all in the 60 minutes, which tells you all you need to know about the dreadful nature of their display. Padraig Joyce had to tog out a few years more than he had anticipated to save them from relegation in the past, but based on last weekend's display they could be dancing on the relegation trapdoor again. County champions Corofin were 2-15 to 0-8 victor's over Cortoon Shamrocks with county U21 player Colin Brady and Micheal Lundy netting the two majors. Despite lining out without established midfielders Daithí Burke (county hurling ) and Ronan Steede (knee injury ), Kevin O'Brien's men confirmed they will be the team to beat again in 2017. An addition to their defence this year is county U21 defender Dylan McHugh who impressed at the weekend. 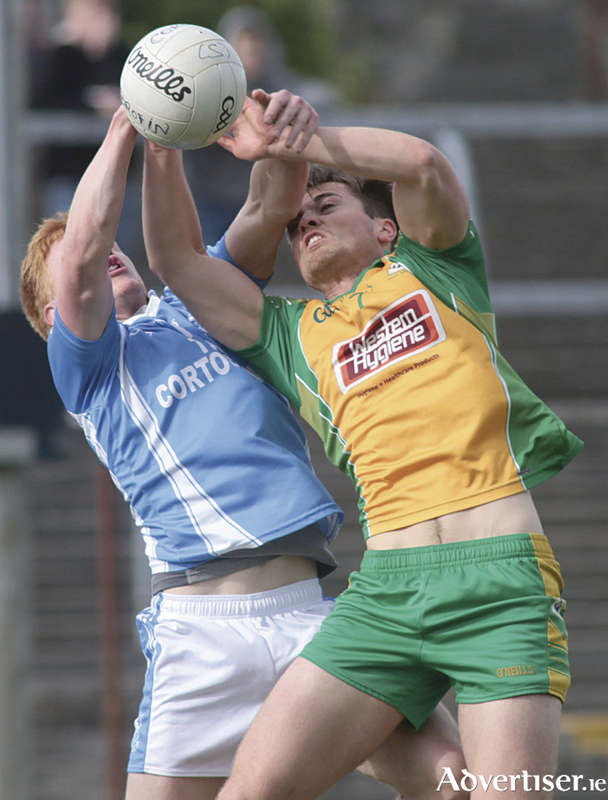 Joe Donnellan hit a few points for the Shamrocks in what was a tough 60 minutes for them and as everyone knows the Corofin bucks are again the team to try to take down.